I had never heard the literary term cozy mystery (or cozies) until I started marketing my novel Dee Ann. From the number of agents I saw requesting cozies, I decided this genre must be a popular one. Exactly what is a cozy mystery, I wanted to know. In fact, now that I know what they’re called, I realize I myself have enjoyed several cozy mysteries. For example, I recall becoming positively addicted to the “Cat Who” books by Lilian Jackson Braun: The Cat Who Could Read Backwards, The Cat Who Saw Red, The Cat Who Knew Shakespeare, The Cat Who Lived High…etcetera, etcetera. I read as many of the twenty-nine in the series as I could get my hands on. 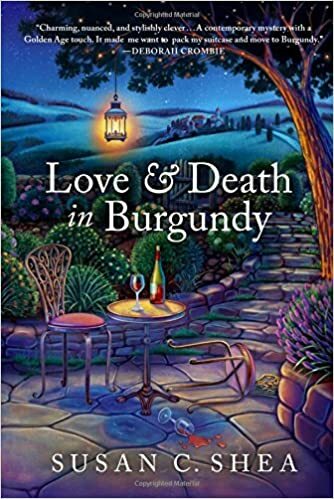 Recently, I finished a new release, Love & Death in Burgundy by Susan C. Shea. Set in a small village in France, this cozy mystery is as much about the problems of a transplanted American wanting to be accepted by the natives as it is about discovering how Monsieur Bellegarde actually died. But that’s the hook of cozy mysteries. The reader gets so immersed in the life of the main character, a.k.a. the amateur detective, that usually the whodunnit becomes secondary. Hmm, maybe I should revise my novel. I could kill someone off, and Dee Ann could become an amateur sleuth. Readers do like a page-turner.